DePaul (10-14; 3-9 Big East) snapped a three-game losing streak in emphatic fashion with an 80-63 win over Providence (16-9; 7-5 Big East) at the Dunkin Donuts Center Saturday afternoon. 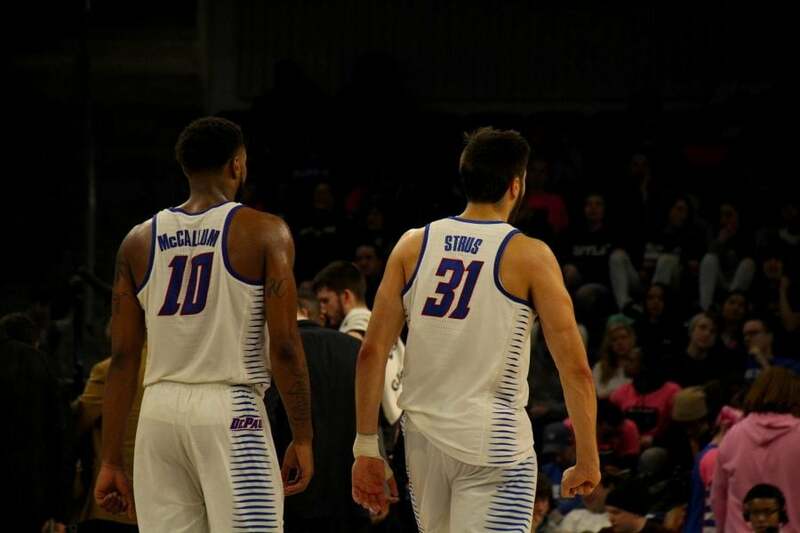 The Blue Demons jumped out to a 16-point lead after a 14-2 run shortly before halftime led by a string of great plays from freshman forward Paul Reed and graduate transfer Marin Maric. Reed continues to improve as the season progresses as was demonstrated Saturday with nine points and two steals in eight minutes of action in the opening half. DePaul head coach Dave Leitao was pleased with how his team used their defense to create offense. DePaul closed out the first half with a bang when Eli Cain hit a deep three to give the Blue Demons a 15-point lead heading into half. Cain had 10 points in the first half, and hit all four of the shots he took. The Blue Demons were efficient offensively shooting 59 percent, while holding Providence to 34 percent. The Blue Demons didn’t let up to begin the second half, opening on a 16-2 run to create a 56-27 lead behind nine points from Strus in the first five minutes of the half. Strus finished with 17 points, including 14 points in the second half. Rather than sitting back, the Blue Demons attacked in transition as Providence tried to get back in the game by pressing DePaul. For much of the second half, the Blue Demons held a comfortable lead of over 20 points, even extending the margin to 31 with 13:45 to play. The Friars closed the gap to 15 with 47 seconds remaining following an 11-1 run, but it was too late to do anything other than narrow the final margin slightly. Providence coach Ed Cooley credited DePaul for not allowing the Friars to get in any sort of rhythm. Maric led the way with 18 points and eight rebounds, while Tre’Darius McCallum had a double-double with 12 points and 10 rebounds. The Blue Demons led for close to 31 of the 40 minutes, telling of how dominating an effort it was. On the other hand, Providence, in need of a win to continue building their tournament resume, could never get going, trailing from the 11-minute mark of the first half when the Blue Demons went on an 11-2 run to begin taking control. Next up for DePaul is a home game Wednesday against streaking St. John’s, who have picked up wins over Duke, Villanova and Marquette in the last two weeks. The Blue Demons beat the Red Storm 91-74 in early January.